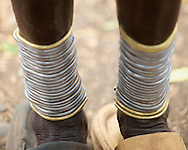 The Bodi are pastoralists living close the Omo River in south- western Ethiopia. 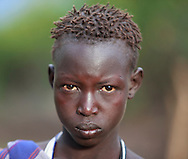 Although they do cultivate sorghum along the banks of the Omo River, their culture is very much cattle centered. 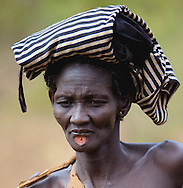 Similar to the Mursi, livestock plays an important role in marriage, divination, and name-giving rituals. The Bodi classification of cattle is complex, with over eight words to denote different colors and patterns. Bodi dress is simple. The women wear goatskins tied at the waist and shoulder, while men fasten a strip of cotton or bark-cloth around their waist.